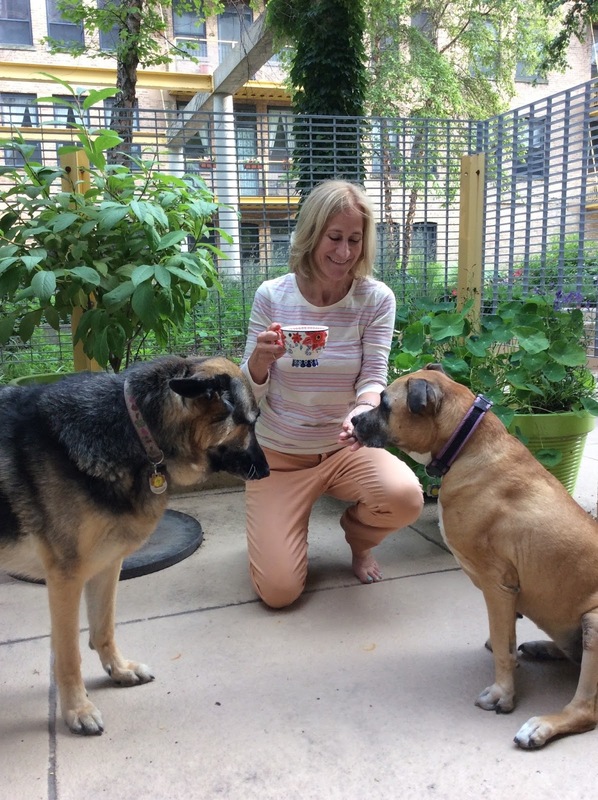 Hello, I’m Anne Calcagno, author of Love Like a Dog, and a professor at the School of The Art institute of Chicago. Qalilah is a bully breed dog; she inspired my novel. She’s now twelve and a half. Luna is a German shepherd; she is nine years old. Every morning I stumble out of bed. I’m a troglodyte, hair wild, pounding my way to the coffee pot. Right away, Qalilah and Luna to run to the patio door. Time to let us out! They like to hang there until I’ve got my coffee in hand. Trader Joe’s Italian Roast and hot milk (whipped up in my Capresso). Two urgent cups, inhaled one after the other. Post patio, a crunchy dog biscuit. Mornings are great! Our six-year-old son, who is quite literal, thought we should name our little pit bull puppy “Little.” But this word sticks like peanut butter to the roof of your mouth. We tried the Italian, Piccola and the French Petite. But the Arabic translation, Qalilah, sold us. We brought Luna home, on a moonlit night, from the vet’s office where she’d been abandoned, hence she’s Luna. My daughter and I volunteered at the CARE Animal shelter in Evanston. There we discovered the current plight of the bully breeds; their being overbred to be fought, all too often abandoned which inundated animal shelters. I discovered the breed’s history as a much beloved family dog, once upon a time nicknamed “America’s babysitter.” When we learned about a dam due to deliver, we were on our way to getting Qalilah. A few years later, after a day of sledding with Lucien, our son, we saw a very black young furry dog with a woman. The dog would stare at the snow, then plunge face down into it, get back up, stare at the snow, then plunge face down into it. We asked the woman, who was a vet tech at the Mayfair Animal Clinic, if we could pet her dog. She told us the young German shepherd was looking for a home. “Pleeeease, Mom! Pleeease!” Luna joined us. How do your dogs help--or hinder--your work? Whether I’m writing, preparing for a class, or reading student papers, I’m alone a lot. The dogs’ antics – running to the door to bark at passing canines (Luna), jamming up against me, staring intently indicating: I want to be let out to lie in the sun (Qalilah) – remind me there’s a life outside my head. Their interruptions are wonderfully distracting company. Have any actual dogs inspired fictional dogs in your writing? My novel, Love Like A Dog, is dedicated to “anyone who has ever loved a dog, especially a misunderstood one” say – in our case – a bully breed like Qalilah. The fact is, I was keen on writing a love story and was casting about for compelling characters, when I realized the love story was right in front of me. Our son had been attacked by the first dog we took in; we had not understood how difficult a large fear aggressive can be. I saw her attack him from behind; she bit his arm down to the bone. That night, after so much blood, tears, and tension -- as I was finally tucking him in, he begged me, “Please don’t be angry at her mommy; she didn’t know what she was doing. Don’t, don’t hurt her.” At that moment I understood how encompassing a boy’s love for a dog could be. I was on my way to writing a love story about a Chicago pit bull rescue. I’m grateful Love Like a Dog won 3 awards. Qalilah: I used to consider squirrel chasing my personal mission. Now that I’m twelve I’m more tolerant or lazy. Luna; I believe I must defend our fenced patio from with my life. My motto: watch out, strange dogs. Qalilah thinks I’m neurotic. Rope pull tugs, squeaky stuffed animals. We have no idea how to catch balls so stop throwing them. Qalilah needed a BFF because she’s always been super outgoing and dog friendly. We could hardly keep up with her constant need to socialize. Turns out, Qalilah is the love of Luna’s life. Qalilah tolerates Luna’s obsessive affection (All right already, I know I’m terrific). Luna is intensely devoted; none of us can question for an instant how much we glow in her eyes. It’s most flattering. Qalilah makes us laugh; she throws herself on the floor, legs up, and does huge wiggle dances on her back. Sometimes she falls asleep with her legs straight up in the air. She’ll run in circles on the bed, until she collapses. She’ll snuggle close to us, then closer, with a slow edging tactic. When she’s draped over both your legs and snoring, she’s convinced she’s tricked you into not noticing. If your dogs could change one thing about Chicagoans, what would it be? Aren’t fireworks supposed to be illegal?? Then why Navy Pier? Fourth of July? Jeez. Liv Ullman for Luna (because she’s psychologically so complex). What advice would your dogs give if asked? Live for the moment, darling. 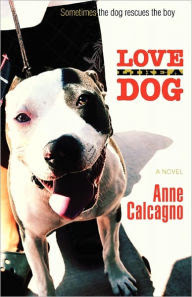 Visit Anne Calcagno's website and the Love Like a Dog website.